The Lakeshore Learning classes allow children ages three and older to create a simple craft project that they can take home for free. The craft classes for kids are typically held every week on Saturday and provides an opportunity for kids to create and learn in an environment that's welcoming to both the parent and the child. The craft projects are simple enough for toddlers but can be tweaked for the older children as well. 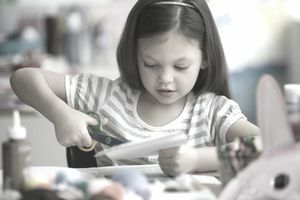 Since Lakeshore Learning focuses on educational products that will make learning fun for toddlers up to kids in the sixth grade, their free craft classes reflect these ideals with fun and educational craft projects. These classes are similar to other free classes for kids such as the Home Depot Kids' Workshops. There are also in-store events like this one at The Disney Store, Toys 'R Us, and LEGO stores. Visit Lakeshore Learning's Free Crafts for Kids page to view the Lakeshore Learning class schedule to see the upcoming classes in the next few months. No registration is required for the Lakeshore Learning classes; just show up during the time of the class to let your child participate. All the materials will be there to let your child complete the craft project. Find a Lakeshore Learning store near you so your child can take part in these fun craft classes. Typically, the Lakeshore Learning craft classes take place every Saturday from 11:00 AM to 3:00 PM, with a few of their stores having the craft classes on Sunday instead of Saturday. Parents are invited to bring in their children anytime during the class period to complete the craft. Be sure to check with your local store to verify the date and time of the craft classes before you take the time to head out. The Lakeshore Learning classes teach kids how to create a wide variety of crafts that kids can create with little or no assistance. In the past, Lakeshore Learning classes have been seasonal crafts, paper toys, cards, masks, wreaths, butterflies, bookmarks, headbands, bird feeders, hats, placemats, animal crafts, wind chimes, finger puppets, bracelets, and just about every other kid's craft project you can imagine. If your child sees a craft on the schedule that they like but you aren't able to attend the class where they can make it, Lakeshore Learning provides the directions so you can make it at home, on your own time. Select any of the upcoming class photos and a PDF file will open. Here you'll find the materials you need, directions for making the craft, any templates that are needed, and a color photo of the finished product. Print out the directions and you're ready to gather your materials and help your child get started on their craft project. If you do decide to make it at home, you'll have to purchase the materials yourself for the project. Other resources for kids can be seen through the Lakeshore catalogs where you can purchase items for home activities. You can request the catalogs for free and even view them online instantly. Children must be three years of age or older to participating in the free classes at Lakeshore Learning. A parent or guardian must be present with the child to supervise them and help them out if needed. No reservations are required. If you have any other questions about how these Lakeshore Learning craft classes work, feel free to contact your local store or the Lakeshore Learning customer service. On that page is a phone number and a contact form.